It has to be said that fiestas in the region of Valencia are among the noisiest in Spain and Las Fallas (or Falles in Valencian) is one of the largest celebrations. The celebration is in honour of saint Joseph. 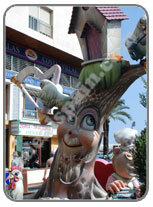 The Falles refers to both the celbrations and the monuments created especially. 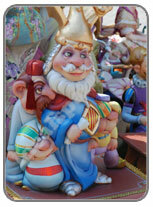 Each neighbourhood of the town will spend all year creating a Falla which is a huge, decorative work of art. After being shown off all week, it will eventually be burnt. During the week there will be street parties, bands, parades and lots of fireworks. 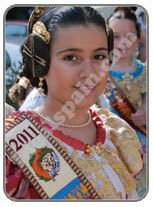 There are competitions for the best Fallas. The winners are usually burnt last. The burning of the Fallas is called the Crema. The large firework displays are called Mascleta and these occur at 2pm each day. 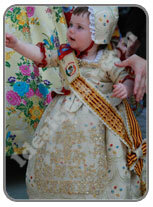 The Crema is on the last day of the fiesta (19th March). This is a huge affair when all the fallas will be burnt. Each may also be adorned with fireworks which are lit first. The climax of the celebration is usually the municipal Mascleta. This huge firework display is organised by the council. The costumes worn for Las Fallas are traditional valencian style, brightly coloured and decorated with gemstones, jewellery and sequins. The ladies hair is quite unique. A coil of hair is worn on either side. 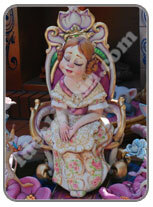 The Fallas celebrations are almost unique to Valencia, they happen in very few other countries in the world.